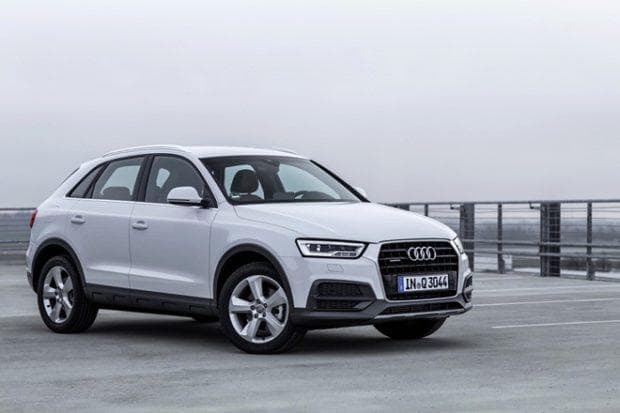 German premium automaker Audi has launched an updated version of its most affordable SUV, the Audi Q3, in India. The new Q3 comes with a host of attractive new features, better styling as well as fresh engine options with the price starting at Rs 34.2 lacs (ex-showroom, New Delhi). After the A3 Cabriolet facelift and the Audi A4 diesel, this is Audi's third launch for the year 2017 as the company is looking to attract more Audi fans from India to join the Audi family. The new Audi Q3 is available in two different powertrain options: front-wheel drive (FWD) and Audi's signature all-wheel drive (AWD). The 2.0 liter TDI (Turbocharged direct injection) front-wheel drive diesel engine, mated to seven-speed S Tronic transmission pumps out 150hp and a peak torque of 340Nm, maintaining an impressive fuel efficiency of 18.51 kmpl. And the all-wheel drive 2.0-litre TDI Quattro engine produces a maximum power of 184hp and 380Nm of torque mated to the same seven-speed S Tronic gearbox, with a rated fuel economy of 15.17 kmpl. The FWD variant can propel itself from 0 to 100 kmph in 9.3 seconds while the AWD version does the same in just 7.9 seconds. In terms of design and features, both the variants get a similar treatment. Changes in exterior include new air intakes mounted on the front bumper imparting a rugged and aggressive look to the car. The revamped bumper, due to its sharper lines and striking shape emphasises the character of the Audi Q3. There is also the standard panoramic sunroof, the 17" Wheels along with LED Headlights and signature LED DRLs (Daytime Running Lamps). The interior gets an elegant walnut brown inlays in the FWD variant while the AWD version features a sporty aluminum tangent inlay. There are front seats with standard electric adjustment, deluxe 2 Zone automatic air conditioner and an infotainment system with voice dialogue system, Audi sound system, Audi music interface with Bluetooth, phone box with USB slot, MMI navigation etc. Taking care of safety and comfort of all occupants, Audi has loaded the Q3 with a reverse parking camera and cruise control, Hill-start and descent assist, Electronic Stabilisation Program (ESP), Electromechanical parking brake, 6 airbags and ABS (Anti-lock braking system) as standard. Rahil Ansari the Head of Audi India, said, that the Q3 has been a segment leader since its introduction and the best-selling model. He also revealed that there is a total of ten launches lined up for this year, the launch of Audi Q3 being the third. The new Q3 FWD variant is priced at Rs 34.20 lacs, and the AWD Quattro is priced at Rs 37.20 lacs (ex-showroom, New Delhi).